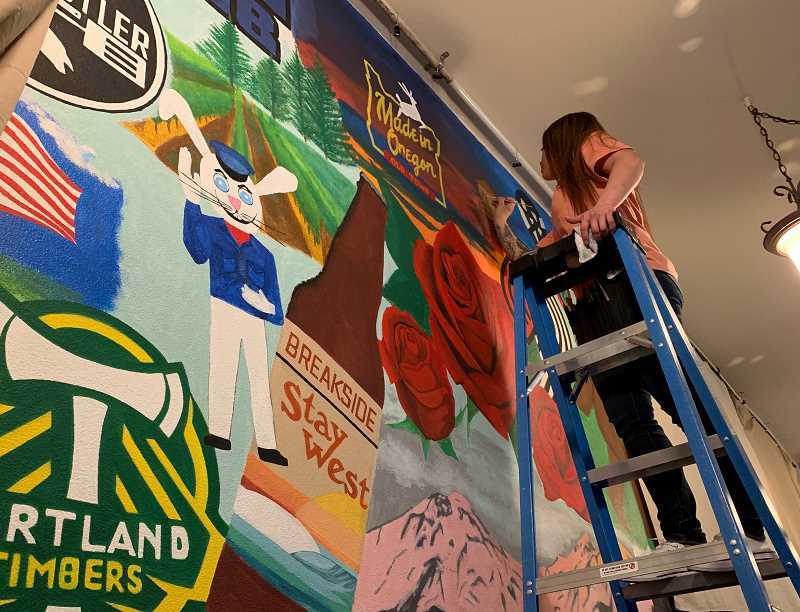 Up on an eight-foot ladder, an artist stands before a 300-square-foot wall, delicately pressing her brush to add fine details to Portland's iconic "Made in Oregon" sign. Forest Grove resident Amy Moreno spends almost four hours every other night since Thanksgiving after closing time at Boxer's Pub N Grub on Pacific Avenue to work on her biggest project to date. Born and raised in town, Moreno moved to Beaverton before she found her way back to Forest Grove, where her 12-year-old son now attends school. She found herself looking for a job last year, and after taking her family to Boxer's one night, owner Rebekah Thomas asked her if she knew anyone who needed work. Moreno was hired on the spot to be a bartender. "I started the next day," Moreno said. "It was a different experience, and was my first time in a job like this." Working behind the counter didn't come naturally to Moreno, Thomas said. She ended up firing Moreno, then bringing her back, on three occasions. "I don't believe in giving up on people and she is a single mom, and I kept asking her to come back to work," Thomas said. "But with that, I noticed she would doodle, and she told me she loves painting. After looking at that, she began hosting paint nights. It was successful, and it was really cute." Thomas saw potential in Moreno — not as a bartender, but as someone who could bring Boxer's to life, she said. Moreno said Thomas asked her to draw artwork for the chalkboard and menu signs. "She found out I was good at it," Moreno said. "After approaching me about the mural, I was excited." Thomas bought the business, formerly called Little Monkey, in 2016. She said the place has turned around significantly since she has purchased it. "I put new tables in and painted," Thomas said. "When I bought it, it was so dingy. We completely cleaned it up, and now we see people being hesitant to come in because of what it used to be. But we are family-friendly and have family-style meals." Thomas graduated Forest Grove High School in 1991. She sees herself as someone giving back to the community by being a local business-owner. "I used to call my first child 'our little monkey,'" Thomas said. "The sign said 'Little Monkey Deli for sale,' and I took it as a sign. It's been a struggle financially ... keeping a small-town business afloat, getting the word out that we are local, we are about community and give us a try. People don't know we are here." To create a brighter, lively space, Moreno and her knack for the creative came to mind, Thomas said. 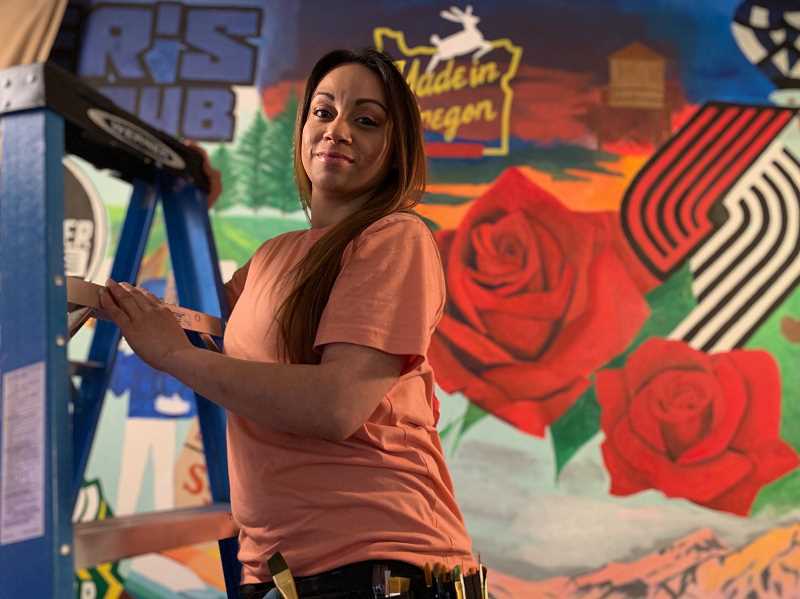 The restaurant space features a long wall without decorations, but now with Moreno's work, it is covered in all things Oregon — roses for Rose City, Sasquatch, the Oregon State University and University of Oregon mascots, and more. There is a little "Easter egg" on the wall for almost everyone to find, Thomas said. All of it fits with the theme she originally pitched to Moreno: bringing community together and celebrating the area they live in. At first, Moreno thought she would paint the Oregon Trail, but the concept soon blossomed to include more of the signature items depicting what Oregon is all about. "Everything I wanted up there, she put up there, but (she) also added something special," Thomas said. "Her son's football number is up there." Beginning a painting project is not inexpensive, and Moreno found ways to cut costs, like creating her own projector out of cardboard and a phone light to be able to launch images up on the wall for tracing or reference. "This is why I don't give up on people," Thomas said. "I would never think to do something like that, ever. But she has this creativity. I gave her an opportunity to show herself , and the other thing is this gives something unique to the business that people will want to come check out." 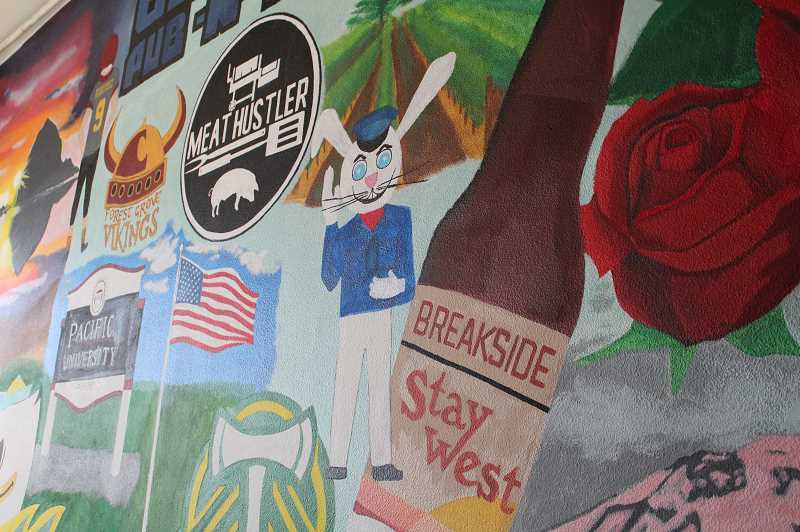 One of the logos on the wall is for Meat Hustlers, a business owned and operated by two Forest Grove teachers who are friends of Moreno. "I am hoping the town responds to Amy as a local artist," Thomas said, "to give her a start, and for people to check us out and see the beauty of it inside." Moreno's love for art began at a young age, she said. As she got older, she took drawing classes, and it became something truly important to her. "It is an escape from me from everything that is going on," Moreno said. "I'm always doing some type of project for somebody, like family. It is never stressful." As she sets up for the night of painting, she'll play some 1990s R&B, like Boyz II Men. It helps her focus, she explained. "I don't do everything at once, I zone in one piece at a time," Moreno said. Roses and floral designs are the first thing Moreno gravitates to when she puts pen to paper. She said she can envision trying her hand as a tattoo artist someday, or taking on art as a full-time career, she said. Being a single mom is tough, but her family is majorly supportive, she said. Moreno's son will make art alongside her, and he's good at drawing, just like his mom. "If there is something you are passionate about, and it makes you happy, you have to make time for yourself to pursue it," Moreno said. "I've been in a lot of jobs, and I have not been happy to go to work until I found art is something I could pursue. I am in a happier place. Doing something you love, it is awesome." To see the mural and celebrate its completion, the community is invited to the unveiling party at Boxer's Pub N Grub, 1919 Pacific Ave. in Forest Grove, and to meet Moreno on Thursday, March 21, at 4 p.m.